Summer promotions are coming and here is one offer you can't resist. 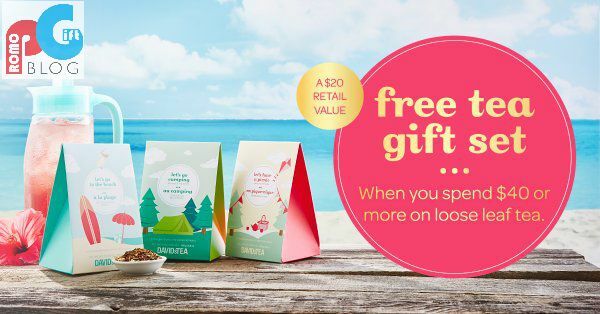 Canadian tea specialists, DAVIDsTEA known for their largest collection of organic teas and infusions across North America, are currently offering a free tea gift set worth $20 with every purchase of $40 or more on their huge variety of loose leaf teas. Each box contains 3 different kinds of tea and being healthy, full of flavour and great for bringing people together, this gift with purchase does the trick so get it while you can. This particular offer is great for brand value. Tea leaves themselves can be pretty expensive, especially for good quality. So offering a free gift to compliment your tea drinking and provide a better drinking experience will make any customer be glad to buy your product now, and in the future. An actual gift set is a nice product for keeping and sharing with friends and family. With tea being used to bring people together, a tea gift set will help increase awareness to your products range and what it stands for. A useful and practical gift like this will leave a better brand image. A gift with purchase is a nice marketing technique to entice people to buy your product and acts as a pull factor to help increase product sales. In general its a fantastic campaign to increase your older product range and for introducing new products onto the market, especially if you have many teas to choose from! Promogift Blog would like to thank DAVIDsTEA for an insight into another amazing promotion offered.